My son is a big Harley Davidson guy and he is going to turn 40 next year. I would like to make him a quilt with the HD theme. Do you know if there any patterns available? Or maybe some ideas for the type of blocks I could make?
. Here are some suggestions! To purchase fabrics, I did find some on eBay. So how did our kids get to be so old? We must have had them when we were 12! bear Paw quilt company has lots of novelty fabrics, along with Harley and other motorcycle fabrics. if you google 'motorcycle quilts' or Harley quilts you will find a gallery with lots of them to check out. I made one about 10 years ago & don't think I still have a picture of it-since that was a couple computer's ago but google images have many in the galleries. Harley Davidson Motor Company is highly protective of their logos and trademarks. They do not license to any fabric manufacturers. Any fabric you find on e-bay or the like with HD bar and shield logo or the words "Harley Davidson" will be cut up sheets. So you are much better off finding HD sheets and cutting them up yourself. There are plenty of motorcycle novelty print fabrics but a true HD enthusiast will immediately spot that the bikes depicted on these fabrics aren't necessarily Harleys. As a rider and enthusiast myself I know of what I speak. The T-shirt quilt is the best bet. It would be most appreciated and used and the beauty is you can use T's that are well past being wearable. They can be stained, ripped, have holes, it's all good as usually the dealer imprint on the back is in good shape. I have made MANY Harely T-shirt quilts. Several on commission, a couple as gifts and quite a few as a fund raiser for my club. They are quick and easy to make and they always look great as long as you take your time and cut and sew carefully. You can do simple settins or creative ones. They look great tied or quilted, with fat or skinny bat and I have never come across an HD enthusiast who didn't absolutely LOVE them. I ordered sheets and pillow cases online, the pillow case has a Harley emblem on one side and a soft tail Harley on the back. I cut those out and figured the size of quilt I needed and bought the black and orange flame fabric (Walmart carries it). I then added black fabric to increase the size of the quilt to what I needed. I quilted it in a flame pattern, but I outlined the HD emblem and I went around the motorcycle, individual flames, motor, spokes, and anything that was in orange, I used black sheets for the backing, when everything was quilted the back of the quilt will also show the quilting (it actually turns out as a reversible quilt. The sheets and pillowcases are in black and orange. I have made 25 to 30 of them and I have donated many of them for fund raisers and gifts to all the men in my family. No 2 were ever alike. I am tired of looking at black and orange - so I have sworn to never make another. What great ideas and beautiful quilts. Thanks so very much for sharing them with me. I know now what I am going to do. This board is great! 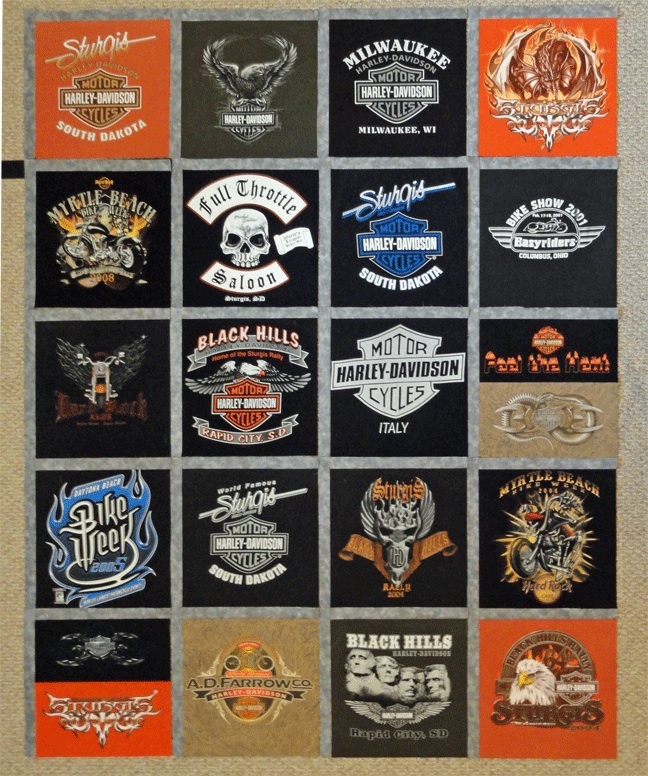 I am working on a Harley T-shirt quilt for a customer now. I cut out the design from the t-shirt which has fusible interfacing on the back. They are sewn together with Harley fabric as sashing. I have a Harley motorcycle quilting pattern that I will use to quilt it on the long-arm. 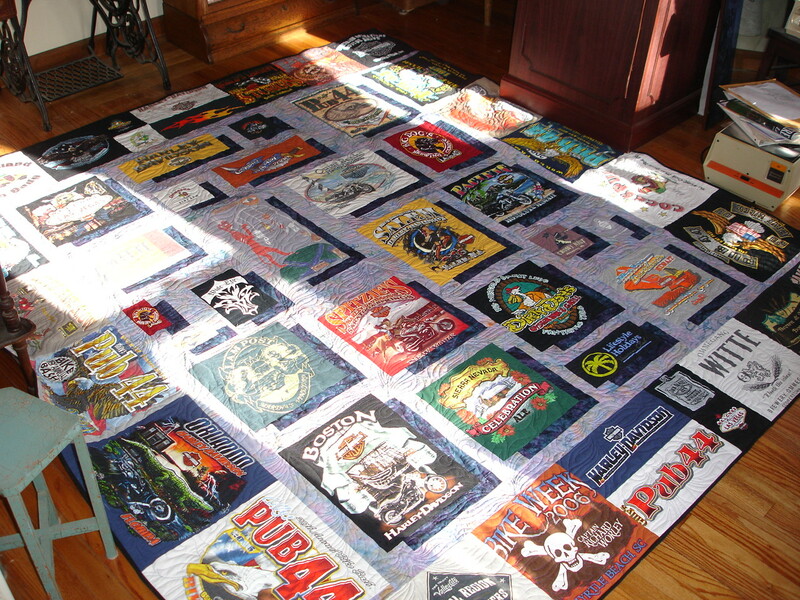 I have several other ideas that I used to make NFL team quilts that could be used for a Harley quilt. Hope this helps. I will be glad to help in any way I can. You can find examples of my work on www.addictedquilter.com and my Addicted Quilter Facebook page. Here is the one I made my brother. I bought the decal at the dealership.